Kidneys critically contribute to the maintenance of whole-body homeostasis by governing water and electrolyte balance, controlling extracellular fluid volume, plasma osmolality, and blood pressure. Renal function is regulated by numerous systemic endocrine and local mechanical stimuli. Kidneys possess a complex network of membrane receptors, transporters, and ion channels which allows responding to this wide array of signaling inputs in an integrative manner. Transient receptor potential (TRP) channel family members with diverse modes of activation, varied permeation properties, and capability to integrate multiple downstream signals are pivotal molecular determinants of renal function all along the nephron. 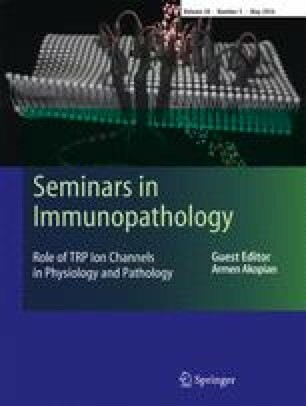 This review summarizes experimental data on the role of TRP channels in a healthy mammalian kidney and discusses their involvement in renal pathologies. The research program in Dr. Pochynyuk’s lab is supported by NIH-NIDDK DK095029 (to O. Pochynyuk), and by AHA- 15SDG25550150 (to M. Mamenko).